An active freelance flutist in the Los Angeles area, Julie Long has played with nearly every major local ensemble at every major local venue. Hailed “a terrific flutist” by Julius Baker and called “the real deal” by Jim Walker, Julie is most comfortable playing a variety of classical generas: from early music to contemporary, from solo to large ensemble. As an orchestral flutist, Julie has performed with the Los Angeles Philharmonic, Los Angeles Chamber Orchestra, Los Angeles Music Center Opera Orchestra, Los Angeles Master Chorale Orchestra, Pacific Symphony, and others. She became a member of the Riverside County Philharmonic Orchestra after winning the second flute audition in the Fall of 2005. As a studio recording artist she has played on dozens of major motion picture soundtracks, such as Fantastic Four, Superman Returns and Horton Hears a Who. Julie became passionate about chamber music as a student at U.S.C., where she was recipient of the Outstanding Woodwind Chamber Music Student Award for two consecutive years. In 1999 Julie joined the new music group, Ensemble Green, which specializes in performing music of Los Angeles composers. With a D.M.A. minor in early music, Julie plays wooden Renaissance and Baroque flutes and has performed with the Los Angeles Baroque Orchestra, Bach Collegium San Diego and Con Gioia Early Music Ensemble. 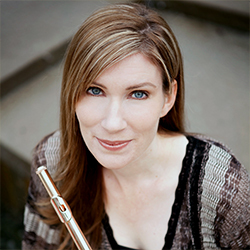 Julie has presented dozens of solo recitals and was one of six finalists in the National Flute Association Young Artist Solo Competition in 2000 and 2002. Her knowledge and interpretation of the flute repertoire has led her to inspire many young flute students. She is currently flute professor at Long Beach City College and Concordia University, Irvine. She was flute coach for the Idyllwild Arts Summer Program 1997-2013. Julie received a B.M. from the Cleveland Institute of Music and has M.M. and D.M.A. degrees from the University of Southern California.